Futurist Gerd Leonhard breaks new ground again by bringing together mankind’s urge to upgrade and automate everything—down to human biology itself—with our timeless quest for freedom and happiness. Before it’s too late, we must stop and ask the big questions: How do we embrace technology without becoming it? When it happens—gradually, then suddenly—the machine era will create the greatest watershed in human life on Earth. Technology vs. Humanity is one of the last moral maps we’ll get as humanity enters the Jurassic Park of Big Tech. Gerd Leonhard is a new kind of futurist schooled in the humanities as much as in technology. In his most provocative book to date, he explores the exponential changes swamping our societies, providing rich insights and deep wisdom for business leaders, professionals and anyone with decisions to make in this new era. If you take being human for granted, press Reset now with this passionately argued call to create a genuinely braver new world. As humanity rushes headlong into a world first served and soon dominated by technology, futurism has become a burning issue for everyone, not just visionaries and geeks. Gerd Leonhard blends humanism wth futurism to create manifestos and creative non-fiction that dramatically widens the franchise and audience for near-future exploration. 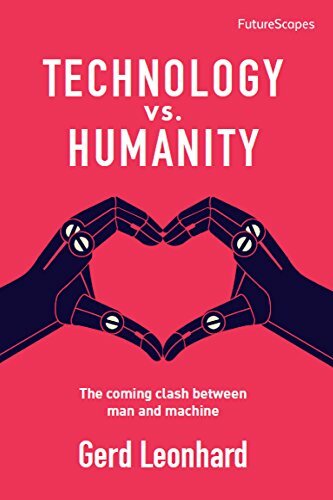 His upcoming new book – Technology vs Humanity – is a breakthrough work of provocation that alerts the world to the imminent ethical and moral choices we will all have to confront much sooner than expected. A musician and creative by background, Leonhard has spent fifteen years living in the future, applying his insights and practical wisdoms to present-day dilemmas from the erosion of work life to the epidemic of digtal obesity that threatens to destroy a generation. Founder of The Futures Agency, Gerd Leonhard travels the world delivering customized advice to enterprise and public organizations of all kinds – helping them to both understand their future choices and discover their ‘true future’. Gerd’s books and essays are supported by an increasing array of multi-media features, including films and webisodes from his own boutique film studios. Together with the Futures Agency advisory and speaking tours, these media properties constitute a unique quarry of groundbreaking insights for individuals and organizations in transformation. Gerd’s other books include The Future of Content, Friction is Fiction and the bestselling The Future of Music. He also contributes a key chapter to The Future of Busines, edited by Rohit Talwar. A member of the Royal Society for the Arts (London) as well as the World Future Society, his client list includes Consumers International, YouTube, Nokia, The Guardian, Google, Sony-BMG, Telkom Indonesia, Siemens, RTL, ITV, the BBC, France Telecom, Orange, Deutsche Telekom, MTN, The Financial Times, DDB / TribalDDB, Ogilvy, Omnicom, the European Commission along with many other notable organizations. Gerd Leonhard is very successfully bringing humanity into the centre of the exponential technology development that we are right in the middle of. He brilliantly discuss some of the polarities and dilemmas that are right in front of us as citizens, politicians, entrepreneurs, business leaders, parents. Everyone that is concerned with how we bring humanity forward in the age of robotics, automation, internet of things, big data, etc. can benefit from the deep insights that Gerd Leonhard so richly is sharing in his 2016 book Technology vs. Humanity. Closely connected to the sound development and transformation of global business leadership myself I give Technology vs. Humanity my warmest recommendations.